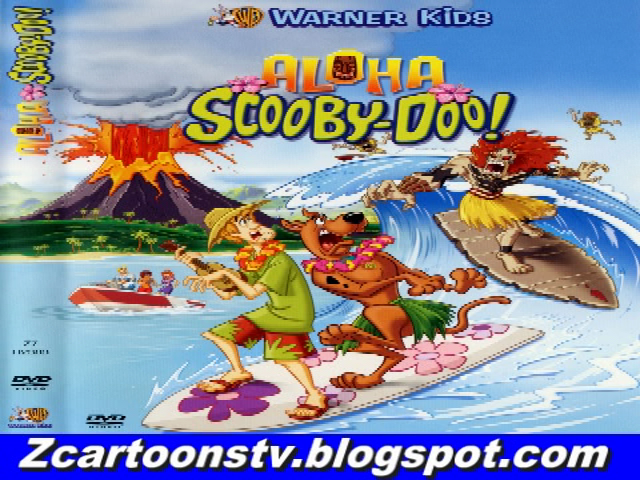 Now You Are Watching Scooby Doo-Aloha in english.If You Have Any Kind OF Problem In Watching Video Then Comment Us.If You Like Our Website Then Share It With Your Friends. The gang wants to get to the bottom of the mystery, and go to Auntie Mahina, a local shaman who lives deep in the jungle. On the way there, Manu gets kidnapped by the Wiki-Tiki. Mahina tells them the Wiki-Tiki is angry at the mainlanders; the surfing contest is hinted by her to be a Hawaiian ritual and that the winner has to be of Hawaiian blood. She says they need to go to the cave where the monster lives to get rid of it, or Snookie and Manu will be sacrificed in the volcano. She also gives Fred a necklace which should keep the monster away. The necklace is filled with an extract from a sacred root called bolan gawana which she claims that the ancients used to repel away evil spirits. The gang goes to the cave, and get chased by bats and the little demons, until they lose them and find Snookie, who tries to lead them out before getting recaptured by the Wiki-Tiki. The gang then find themselves in a snake pit cave, but are able to get out of it because of music by Shaggy and Scooby. Then they find that the Wiki-Tiki is not really an evil spirit after all. They find the demons are just robots and the cave they are in is inside the volcano on the island. They also see the surfboard the Wiki-Tiki is using is from a brand name company, Goha Aloha, which is the very company that sent them to Hawaii. Back at the island, it is only one day until the contest and the locals are really scared something bad will happen. Little Jim blames the mayor for Snookie and Manu's disappearance, and says that whatever happens during the contest will be her fault as well. The next day, Daphne enters the contest in hopes of capturing the Wiki-Tiki, whom they are sure will show up. Sure enough, it comes and scares the surfers and chases Shaggy and Scooby, until it was washed up by a wave. The gang unmasks the Wiki-Tiki, and find it is Manu, who wanted to scare the natives and non-natives away so he and Snookie (real name Pamela Waeawa) could get the real estate on the island; and then sell it back to the original owners at a big profit. Velma also says that Snookie was an expert in rocket science and robotics, and created the "demons". Scooby wins the contest for the way he and Shaggy surfed while battling Manu. Manu was shocked that he lost the contest to a dog, Scooby-Doo. Manu and Snookie are taken to jail, and the gang plus the mayor, Little Jim, Jared Moon, Laluna, and Auntie Mahina enjoy a feast. The gang then enjoy a big Luau, but the Demons advance on them again. Then, strangely, they begin dancing again. It is revealed that Scooby is using a remote control to make them dance. Then everyone laughs while Scooby says his catchphrase before saying "Aloha! ".